“I think we should put a bid on the house we looked at today,” my husband Ted shared with me over the phone. We’d been looking at houses for months. After a year of multiple job losses, two out-of-state moves, and living in a couple rental properties, we were ready to plant roots. We wanted the security of staying “put” for a while. Just a few hours earlier, we’d looked at a foreclosure. While it had a lot going for it, I wasn’t sold on it. The kitchen and bathrooms were old and outdated. The storage was minimal. And in our new home state of Missouri, where a tornado had recently torn through Joplin, it was missing the all-important basement. If it were solely my decision, I’d have passed. But Ted saw potential in this fixer upper. He had a “feeling” we should put a bid on it, and soon at that. Now it may seem that I was won over a little too quickly. Why did I so easily throw my reservations to the wind and go with Ted’s inkling? Do I merely attribute it to being a “submissive” wife? While I’m all for submission, that wasn’t it. Rather, it was because I know my husband and how he makes decisions. Ted is not a fast decision maker. He’s tortoise, as in The Tortoise and the Hare, slow. His normal process is to spend days, weeks, months even, researching a potential “buy,” whether it’s something big like a car or something small like a food dehydrator. And often, after he’s done all of his research, he informs me that he thinks we shouldn’t make a purchase after all. This desire of his to put a bid on a house we’d looked at only an hour earlier was out of character for him. I determined this could only mean one thing: It must be the Holy Spirit prompting him. Before I continue, let me clarify. This isn’t to say that I doubt Ted’s in-character behavior can sometimes be God-inspired. Of course, it can be. Yet, in this particular instance, it was the out-of-character element that caught my attention so quickly. And, judging from what happened next, that’s exactly what God wanted. Mere hours after we went under contract on this fixer upper, we were informed that the month-to-month rental property we were living in was also under contract. We had thirty days to move out. Want to know the crazy part? Thirty days was the exact time it took our foreclosure to close. For anyone who has ever bought a foreclosure, you know it’s normally a lengthy process. That’s not all, though. Remember our desire to stay “put” for a while? Well, nine months later, we found ourselves unexpectedly relocating out-of-state again. Yes … again. This house that Ted felt compelled to buy went under contract only four days after we put it on the market. Talk about fast! Or, it could be that it’s difficult for you to accept that your spouse can sense something from God that you don’t. 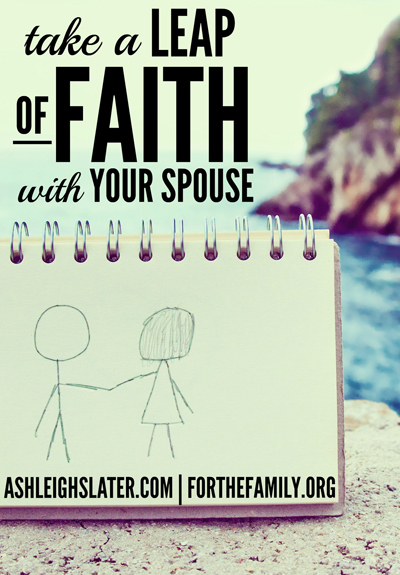 Perhaps you need God to confirm to you first that your spouse has “heard” correctly before you’re willing to join hands and step out in faith. It could even be that you’re concerned your spouse will attempt to play the “God card” in order to get what he or she wants, and you fear manipulation. Whatever the case may be, when it comes to your spouse and Holy Spirit “nudges,” you are resistant.